Living... in Colorado in the large estate his late mother left him with his sister, Veta, and her daughter, Myrtle Mae. Elwood's other housemate is his best friend, Harvey, a six-foot three and one-half inch rabbit. 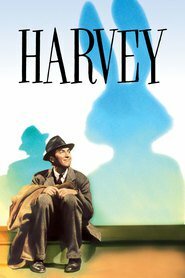 Elwood doesn’t understand why other people don’t ever seem to see Harvey; to Elmwood, Harvey is more real than anyone he knows. Interests... sitting in bars, having a drink or two… or three… or four… or five. At bars, Harvey is very chatty and likes to have deep conversations with other patrons about everything from their hopes and dreams to their deepest secrets. But after Elmwood introduces them to Harvey, they usually need to leave and never come back. Relationship Status... focused on Miss Kelly. They have so much in common, including Ovid, their favorite poet. Challenge... dealing with his sister, Veta, who wants him committed to a mental institution. Veta fears her daughter will never find a suitor because of her crazy uncle, so she arranges to have Elmwood taken to a mental asylum named “Chumley’s Rest.” But Elmwood may get the last laugh; a mix-up results in Veta being the one to get locked up instead. Elwood P. Dowd's popularity ranking on CharacTour is #3176 out of 5,000+ characters. See our top-ranked characters and read their profiles.